FALLS CHURCH, VA, 26 March 2018—NGS has extended the submission deadline for speakers—as well as organizations interested in sponsoring lectures—to submit lecture proposals for the National Genealogical Society (NGS) 2019 Family History Conference. 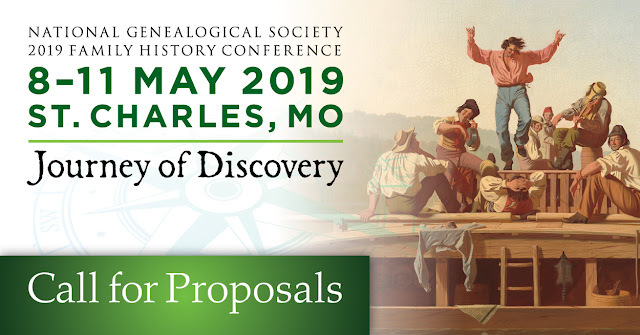 All proposals must be submitted electronically at http://www.ngsgenealogy.org/cs/call_for_proposals 11:59 p.m. EDT on Friday, 6 April 2018. The conference, Journey of Discovery, will be held in St. Charles, Missouri, 8-11 May 2019. Typically, this annual conference attracts between 1,800 to 2,000 family historians and genealogists as well as more than eighty exhibitors and sponsors. NGS promotes its conferences nationally and in regional markets as well as through online social media. 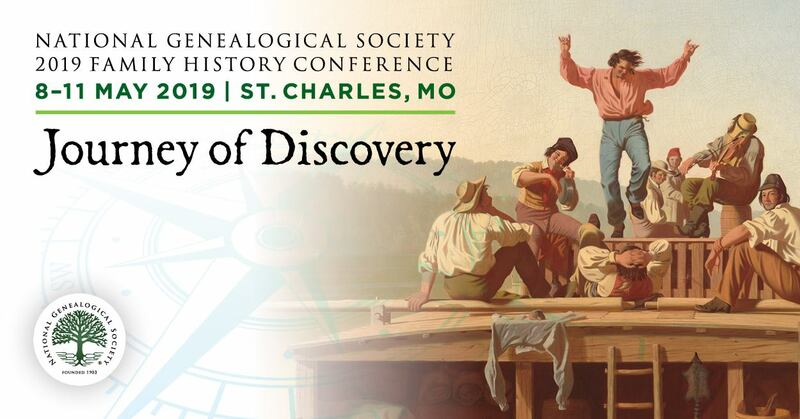 The conference program for the Journey of Discovery will focus on our ancestors’ records and the knowledge, skill, and tools family historians and genealogists need when they embark on a new journey of discover with each family they research. Our American pioneers experienced their own journey of discovery as they migrated to the Louisiana Purchase and the Northwest Territory, thus opening the Midwest and the Plains states to migration and new settlements. Over time, the rivers, trails west, and the railroads were vital to this expansion. Bounty land warrants, the Homestead Act, and the land grants provided many opportunities for settling the Midwest and points west. Native Americans, French fur traders, and Spanish soldiers preceded these settlers, discovering the beauty of the geysers, mountains, and plains years earlier. Migration from the east and south included Americans formerly from England, Ireland, Scotland, and Wales, often traveling with those enslaved or indentured. The end of the Civil War provided opportunities for African Americans to leave the plantations and travel north. The Germans and Irish as well as Eastern Europeans, all seeking new opportunities, poured into the country, establishing new towns and cities, schools, and businesses while maintaining their own customs and religions. NGS invites proposals on all aspects of the journey of discovery. Conference tracks under consideration will address a wide range of topics and include: courts and laws, DNA, emigration, ethnic records, government documents, heirlooms, immigration, maps, migration, military, organizing, regional, repositories, technology, and transportation. Speakers who wish to submit lecture proposals, and organizations interested in sponsoring tracks or individual lectures, should follow the published guidelines at the NGS website page: http://www.ngsgenealogy.org/cs/call_for_proposals. All proposals must be submitted electronically by 11:59 p.m. EDT on Friday, 6 April 2018. Speakers may submit up to eight proposals electronically by completing all the requested information at https://goo.gl/QBXXQA. Organizations wishing to sponsor a lecture may submit proposals at https://goo.gl/zzA8bM. Founded in 1903, the National Genealogical Society is dedicated to genealogical education, exemplary standards of research, and the preservation of genealogical records. The Falls Church, Virginia, based nonprofit is the premier national society for everyone, from the beginner to the most advanced family historian, seeking excellence in publications, educational offerings, and guidance in research. It also offers many opportunities to interact with other genealogists. The words Certified Genealogist and its acronym, CG, are a registered certification mark, and the designations Certified Genealogical Lecturer and its acronym, CGL, are service marks of the Board for Certification of Genealogists®, used under license by board certificants after periodic evaluation. copyright © National Genealogical Society, 6400 Arlington Blvd, Suite 810, Falls Church, VA 22042-2318. http://www.ngsgenealogy.org. Republication of UpFront articles is permitted and encouraged for non-commercial purposes without express permission from NGS. Please drop us a note telling us where and when you are using the article. Express written permission is required if you wish to republish UpFront articles for commercial purposes. You may send a request for express written permission to [email protected] All republished articles may not be edited or reworded and must contain the copyright statement found at the bottom of each UpFront article.